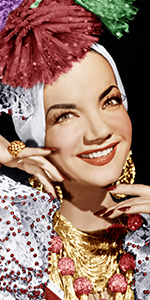 Carmen Miranda became one of the first Latin entertainers to make the big time in America, making film musicals, recordings and appearing on radio. With her bright and sunny personality, exotic dancing and her trademark hats, she charmed veiwers and listeners with her outrageous accent and use of English. She died tragically young. Being the second daughter of a man who emmigrated to Brazil after she was born, Miranda's sister and mother were brought over by her father, who had settled in Rio de Janerio and had opened a barber shop. Her parents had four more children after thier move. Named for the title character in Bizet's opera Carmen, the young girl took up singing at an early age. With her mother's encouragement, she audiotioned for a radio program, but her father strongly disapproved. At 14, Carmen went to work in a tie shop, where she eventually began selling hats she had created — something which would become her showbiz trademark. Working with musician Josué de Barros, Carmen recorded her first Samba recording in 1929: Não vá Simbora. Her second recording sold so well that she signed a contract with RCA Victor in 1930. In 1933, she became the first singer to be given a contract to sing for a Brazilian radio station, first with Rádio Mayrink Veiga, then, with Radio Tulpi. With a 1938 recording contract with Odeon, she became the highest paid singer in Brazil. Carmen Miranda dabbled in Brazilian musical films, most of which delt with Carnaval life, such as A Voz do Carnaval (released in March, 1933). Her number was placed as the finale to the film Hello, Hello, Brazil! (released in 1935), while she was given an acting role and two numbers in Estudantes (released in July, 1935). She was such a big star that her image graced the poster for Alo Alo Carnaval (released in January, 1936), which was a lavish all-star musical with Samba performers — Miranda got top billing. Although she became famous for her colorful fruit-hats, she first sported one in the film Banana-da-Terra (released in February, 1939), to imitate the garb of the poor women of Bahia. Lee Schubert caught Miranda's act at a Rio nightclub and offered her an eight-week contract to appear on Broadway in The Streets of Paris in 1939. Schubert didn't want to hire Miranda's backup band, Bando da Lua, but she dug in her heels. Brazilian president Getúlio Vargas offered to pay for the band's transport, where they all scored a huge success in New York, with Carmen Miranda becoming a media darling. Hollywood came calling. She signed up with 20th Century-Fox, and shot her part in Down Argentine Way (which played the Chinese in October, 1940) while she was working clubs in New York City, while the rest of the picture was shot in Los Angeles. Her next film was That Night in Rio (played the Chinese in April, 1941). The following week, Carmen Miranda actually appeared at the Chinese with her band as the main attraction (with Topper Returns as the B-picture), in hopes that the theatre might prove to be a live-music venue again, but the gross wasn't so much more than what her films pulled, so that was that. She was back on Broadway in December, 1941 for Sons o' Fun, which played until her Schubert contract ran out in June, 1942. During World War II, Miranda's films played an important role in encouraging Americans to consider South American countries as friends and allies. This placed Miranda in a difficult bind; some groups in Brazil began to resent what they saw as her selling out, and playing a Latina ding-dong. Ravenged in the Brazilian press, this reaction to her work hurt her deeply. 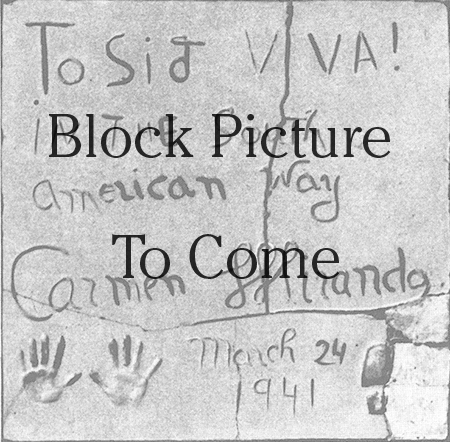 But the heavily escapist nature of the Fox musicals became a tonic to war-weary America, with all of the Carmen Miranda Technicolor musicals making pots of money: Week-End in Havana (which played the Chinese in October, 1941), Springtime in the Rockies (played the Chinese in October, 1942), The Gang's All Here (played in December, 1943), Four Jills in a Jeep (played in May, 1944), Greenwich Village (played in August, 1944), and Something for the Boys (played in November, 1944). After the war, America's interest in Latin America began to wane, and with it, Miranda's headliner status. She was given supporting roles in a pair of low-budget pictures, Doll Face (which played the Chinese in March, 1945), and If I'm Lucky (played the Chinese in September, 1946). Her Fox contract ended at the beginning of 1946. She made Copacabana with Groucho Marx (released in May, 1947) at United Artists, then did two films at Metro-Goldwyn-Mayer: A Date with Judy (released in July, 1948), and Nancy Goes to Rio (released in March, 1950). Her last film was the Dean Martin and Jerry Lewis picture Scared Stiff (released in April, 1953), for Paramount. In early 1953, Miranda performed a tour of Europe, but later collapsed onstage while on tour in Cincinnati. Hospitalized for depression, she eventually spent time with her family in Brazil before attempting a comeback to the U.S., where she performed at the Frontier Hotel in Las Vegas, and also in Havana, Cuba. While rehearsing for The Jimmy Durante Show, Miranda complained of feeling unwell. Although Durante offered to find a replacement, she finished her number. After a wrap party at her home, Miranda suffered a fatal heart attack. She was 46. Grauman's Chinese Theatre, Hollywood, California. Carmen Miranda Forecourt ceremony, Monday, March 24, 1941. 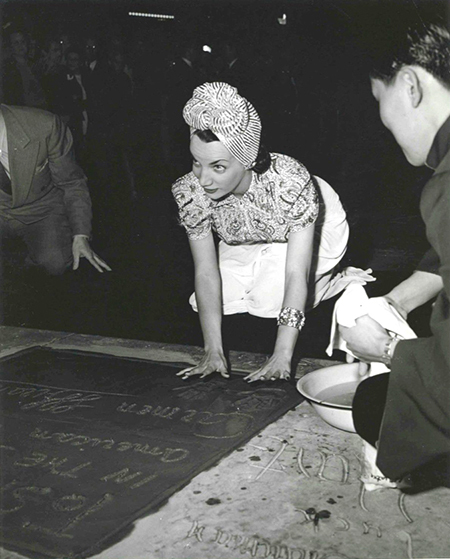 Carmen Miranda looks up at photographers while placing her hands in the cement.